A couple of years back my friend Rafi Hecht wrote a review on Dr. Laffa. Since then, we’ve both gone back and enjoyed their selection, and even had our lunches there. We stand by what we originally stated: that the ambiance is as close to being in Israel without being in Israel. Dr. Laffa was being run by two partners, Yoram Gabay and Sasi Haba. Since that review, a number of things have happened. 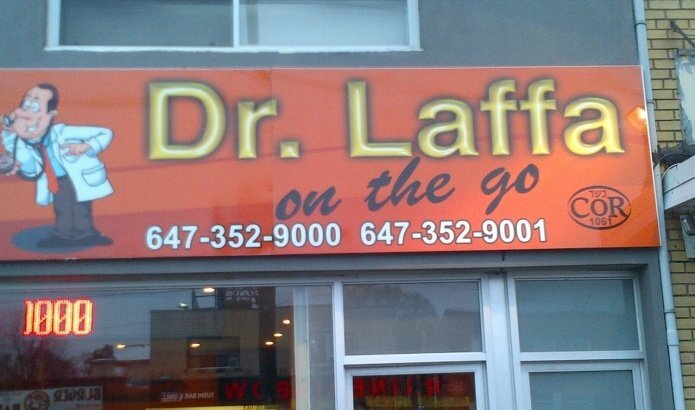 For one, Dr. Laffa became so popular that they expanded to a takeout location by Bathurst and Dell Park, which I frequent. Yoram Gabay was managing the south location and Sasi was running the north location. Then, stuff happened. Like most partnerships, Yoram’s and Sasi’s split up. Like the vast majority of restaurants, Dr. Laffa was knee-high in debt from suppliers. Sasi chose to partner up with one of the suppliers and like many partnerships, end his with Yoram. They also had different visions: Sasi wanted to re-brand and expand to the non-Jewish market with treif locations (as that’s where the money is – though leaving two kosher locations as Famous Laffa Kosher) and Yoram wanted to keep his locations completely kosher. Besides sharing similar names and both being certified under COR, the restaurants’ menus are very similar. Not only do they both offer the same Middle Eastern dishes, often made with laffa, a large soft flatbread that is used as a wrap, but their prices are practically identical as well. It shocks me, in particular, to see two laffa establishments in one strip. If you go back 5 or 10 years, it would be nearly impossible to find a person in the Jewish community who could tell you what a “laffa” was. You could drive for miles before finding an establishment that would sell one. Now as you see things are changing and hopefully things will change for the better. Share this post on your social media channels in support of Dr. Laffa, which is located at 3023 Bathurst St; Northeast of Bathurst and Lawrence.